First of all, a brief warning. This is one of those things that (like the arrow in the FedEx logo) cannot be “unseen”. Once you’re aware of it it will probably annoy you until the end of time. However fear not, thankfully there’s a simple solution to relieve the impending agony. A sharp-eyed and on-beat user at the Windows 7 Taskforce has noted the default “busy” animated cursor in Windows 7 actually stutters a little during its animation loop. If you’re not seeing it at first, watch closely just before the shining highlight returns to the 12 o’clock position, skipping a beat somewhere around “11” on the clock face. …Yes, there it is. If you’d like to test the phenomenon for yourself, simply hover over this paragraph which overrides the cursor to display the busy cursor via CSS. What’s most bizarre is although the style of the cursor is not new to Windows 7, the same cursor in Windows Vista actually does not exhibit the same phenomenon. A closeup of the cursors in slow-motion is provided below for forensic analysis. Diving deeper into the guts of cursor files, its revealed the Windows 7 cursor is actually designed to display each frame for 3 “jiffies” (1/60 of a second) whereas the Vista cursor displays each frame for 2 jiffies. As the cursor animation is comprised of 18 frames in total, that’s a discrepancy of 0.3 of a second per loop. It’s not certain if this is indeed what’s causing the stutter, but it’s a good sign something changed. Nevertheless if this stutter now bugs you, the brilliantly simple fix is to use the Vista cursor instead! If you don’t have a copy of Vista handy, you can get the cursor file here, copy to “%SYSTEMROOT%\Cursors” and configure your “Pointer” settings from the “Mouse” control panel. After that’s all done, simply hover over the test area from above to appreciate the elegance and bliss of a smooth animated cursor again. Update: Leo Davidson has tracked down the root cause of the issue and also made a proper fix download available here. I’m sorry to say but my Windows7 Ultimate 64Bit does not show this behaviour. The cursor animation is smooth. @Andreas Balzer: Are you certain? I’m using Windows 7 Ultimate 64bit too and I see this. You’ve ruined my life now, Long. Thanks. I’m going to notice the damned thing… EVERY. SINGLE. TIME. Thanks. You’ll be hearing from my lawyers, Long. @Long: I am very certain. For me this icon runs smooth. However if more people experience this issue I’ll open up a bug report. I have to correct myself. I just opened the control applet and there I experience the same issue. However when for example hovering the paragraph it runs smooth without any issue. Wow, I didn’t know about the FedEx logo ethier, now I do, reminds me of when I was a little kid and I looked at the Telstra logo and reliased it was a “T”, lol. For those that do not know, Telstra is a major telephone and internet company in Australia. Did you make a clean installation or did you upgrade from RC, ..? @Andreas: Clean installation. This is on my desktop. Happens over here too – fairly clean installation of x64 ultimate. But could this possibly be as design? It seems as though it is a pause rather than a skip. Unfortunately the issue got a bit out of hand on JCXP, but there is a slow-mo video attached somewhere in the thread which clearly shows the jarring glitch ocurring. seems like Linux/Apple fanboys found the article :-/ Now it gets kind of silly. I believed it was intentional though as it has an almost hypnotic effect when stared at for long lengths of time. I’ll also add my name to the list of those unaffected by the stutter. I have only seen it during moments of extremely intensive system use. Why the hell would they even “update” the cursor, when it looks exactly the same as in Vista and it’s not tied to any low-level functions of the OS? I can confirm that this exists on a clean installation of Windows 7 Enterprise x64. I can confirm this behavior on Windows 7 RC1 32-bit. Why on earth would they have changed that cursor? In fact, why did they change this cursor but not the ‘Working In Background’ (Arrow + Spinner) cursor? That’s indeed an interesting find but I can’t see it in my Windows 7 RTM downloaded from TechNet account. The cursor is very smooth and doesn’t stutter. Very strange. I have windows 7 ultimate x64 and it stutters for me too. At least the pause lets you count the number of rotations. Maybe it’s by design? @123: Yes, it’s called “attention to detail” and “quality”. The move was done to add a feeling of oscillation to busy tasks, thus making wait times not feel as long. It’s entirely psychological, and it’s one of the many reasons behind why Windows 7 just feels faster. So they tried to cleanup and innovate on the cursor front and enhance the cursor experience. http://en.wikipedia.org/wiki/Features_removed_from_Windows_7 => (The animated Aero cursor does not animate smoothly enough like in Windows Vista). Maybe your site should have a special section or tags reserved for removed or “a-step-back” features. It’s surprising how MS can bother to modify the cursor but not fix the glaring Windows Explorer issues due to limited time and resources. Damn! Now everyone will prefer the 7 cursor better because it’s not Vista. Dumbing down the cursor is the newest cool enhancement for Microsoft should be applauded and everyone should go and buy Windows 7. This is a showstopper bug! Someone alert Walt Mossberg! Happens on Windows Server 2008 R2 x64 as well however not during installation. Why have they not updated the icon when you select a line of text its still not even aero !!!!!!!! Hmm. i don’t see this on Windows 7 RC Professional 64bit.. My icon runs smooth on both the CSS and the Mouse Control Panel. Anyone who thinks this is even worth blogging about… needs to get a life. It works perfectly fine here. Okay, when I mouseover to your CSS thing, it works fine but in the Mouse Properties, it skips a frame. But not that major a problem I guess. @Manmohanjit Singh: FWIW I can see it in both places. In fact, I find it easier to see in the Mouse Properties window since it animates the cursor more slowly than normal. sorry correction windows 7 ultimate…. Actually, it’s not the timing that’s the problem. In Windows 7 the cursor has two frames for the 12 ‘o clock position. The first and the last frame. There’s no frame being skipped. Just open the file %windir%\Cursors\aero_busy.ani in an editor for animated cursors like Microangelo Animator and see for yourself. @Dorian Muthig: FWIW, I’m not seeing that in the tool I have. Maybe the amount of time each frame is shown is what’s wrong. That info may be interpreted differently (or not at all) by different programs and map to the frames being shown multiple times or not at all. When viewing the cursor in normal use, and within the Mouse Properties control panel, there’s definitely a missing frame (and possibly a repeated frame as well), and the missing frame appears to be in the file. Am I getting paranoid or is the large busy cursor doing the same thing except at 3 o’clock position? 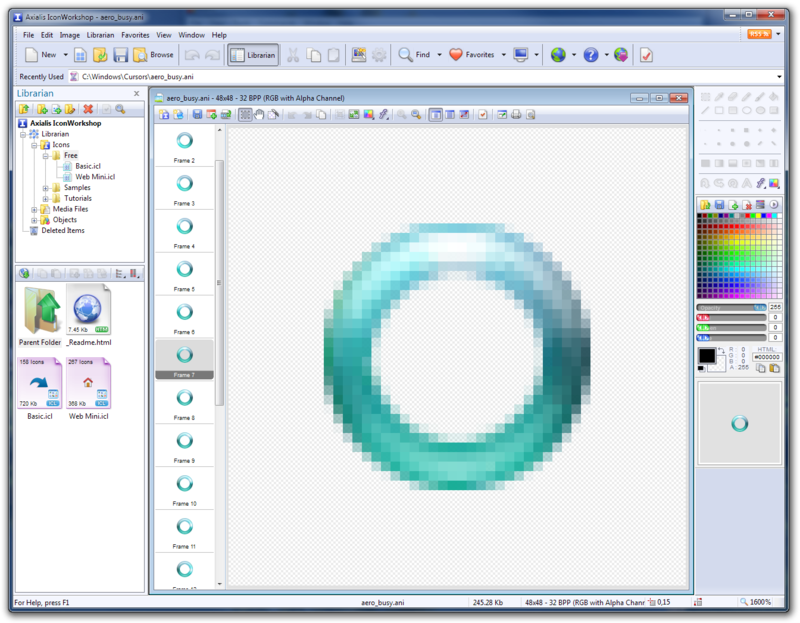 aero_busy.ani contains two sizes of images, 48×48 and 32×32, and the error is only in the 32×32 set. Most ani file editors will show you the 48×48 images, which are fine, and that’s why aero_busy.ani seems fine when you open it up but has the glitch when you actually use it (at normal DPI). I used a hex editor & the .ani format definition to extract the individual .cur files for each frame. Frame 6 is a copy of frame 7. It’s byte-for-byte identical, as the MD5 checksum confirms. What should be frame 6 isn’t present in the file. So at 32×32 the effect is that frame 6 is skipped and frame 7 is shown twice. Also note that the 48×48 images are all unique. Maybe we can copy the 32×32 frame 6 from the Vista version into the Win7 file to get a “perfect” file which has all the right frames at both sizes. You noticed this but not the issue where the Aero lags because of some issue for some users in Windows 7? @Leo Can you confirm the same thing with the large one as well? The ‘large’ Aero Busy cursor “jumps” at the 4 o’clock position. @Nihas: Yes, you’re right. There’s a similar problem there as well. Maybe there’s a problem with the extra-large file as well. Haven’t checked that one yet. BTW, if anyone is wondering why both the “normal” and “large” .ANI have the same image sizes inside of them (both contain 48×48 and 32×32 images) inside of them and also have identical file sizes, it’s just because the “normal” set are padded with more blank space and the images are uncompressed. I can confirm the glitch in Win 7 Pro RTM 32bit, you have to watch really closely but its there..
Oops sorry.. I was using the Extra Large Aero Cursors, that’s why it wasn’t appearing. I tried that to the normal sized cursors and saw the glitch. havent you got anything better to do? These were made by transplanting the missing low-DPI frames from the old Vista cursors into the Windows 7 versions, so that you don’t lose the high-DPI versions and so the animation speed is consistent with the other cursors. * First, ask yourself if you care about the little glitches enough to bother with all of this. i can think of some other things i’d fix instead of the dumb busy cursor animation. @Ben: If only everything else was as easy to fix! Fxcking chinese website(xxdrivers.com) have taken part of the article for their own. Am I the only one who prefers it with the lag? On Vista, it feels like it’s just spinning without doing anything. The slight lag makes it feel more like a machine that actually does something. It’s like waching the hourglass turn around rather than watching it trickle down endlessly, not going anywhere. Microsoft does have an official Windows 7 RC Support Forum located here http://tinyurl.com/9fhdl5 . It is supported by product specialists as well as engineers and support teams. You may want to check the threads there for additional support and assistance. @Johnnie, it’s not wasting life. It’s about how passionate you are about Windows. @Jessica, ha! As if the feedback in the forums makes a difference. I don’t see this behaviour on my copy of Win7 x86 RTM. The cursor itself as well as the preview in Mouse properties animate smoothly. From Jessica: ” [the cursor] It is supported by product specialists as well as engineers and support teams”. Ha ha ha! C’mon! Are people who say it’s not a bug serious? If the mouse cursor is supposed to animate like this, why aren’t the larger versions affected or affected differently? Why is this animating circle not stuttering when used on the welcome screen or in IE8? The exact frame where it stutters is different here. Any one try this on one of the SP1 releases? I wonder if they are doing anything with it.